I have an F14 that I am shopping out/repairing for a friend. The game has developed a switch matrix issue. The game was working perfectly for days, I shut it off this evening to make dinner, come back an hour later power it on and this issue has surfaced. Using the switch edge test, I have determined rows 1 thru 5 all register the switch in row 6. Rows 6 7 8 all register correctly. See pic. I disconnected the switch matrix connectors and used the jumper/diode test on the board and get the same results. These early system 11 games are not my strong point. Ideas or suggestions what is failing? I am comfortable with board work. GLSP3022 last edited this post 5 months ago. After looking over the schematics, I'm guessing an issue in either u30 or u39. They're just upstream. Because the lower 3 rows work fine, it shouldn't be an issue with the 8 driving transistors. I have had these chips fail and produce these symptoms. For the price with shipping, buy a couple extras. First thing to check with J-8 and J-10 removed and power on, all pins (except the key pin) of J-10 should be high if using a probe or close to 5 volts if using a DMM. Then check with a probe all pins of J-8, they should be high with a low pulse. Have you been working around the flippers with the power on? Could you have shorted the EOS switch to the lane change switch? This is the weird part. I've rebuilt just about everything under the hood, but the game was playing well. At power up last night, everything went to crap with the switches. I kinda wish I knew what happened, would make this a but easier to understand. I ordered a 10 pack of these. Socket them and try that first. I'll check this out and report back. Might also check resistor networks at position SRC6, SR11 or SR14. Socketed and replaced U30 and U39. Luckily I already had several of these chips in stock. Switches are working fine now. What caused it? I have no idea. 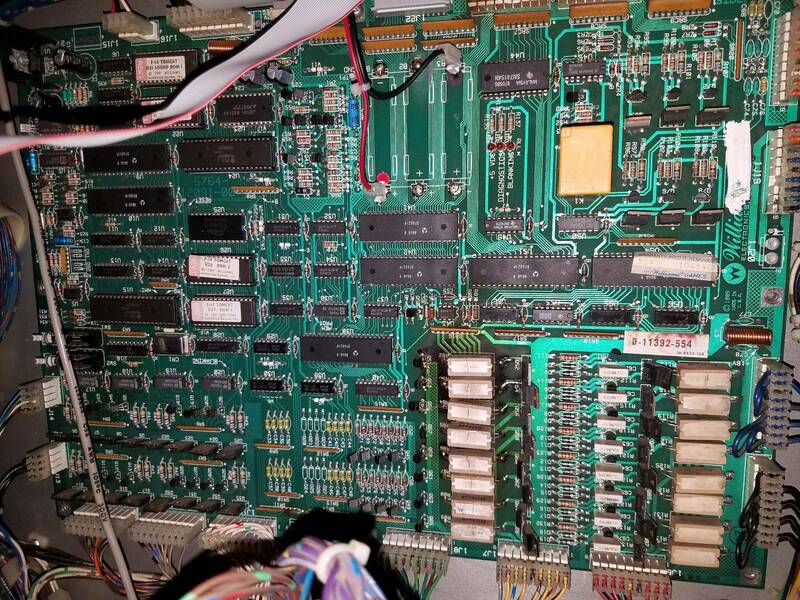 I did a thorough search under the entire playfield and found nothing unusual or close to touching. 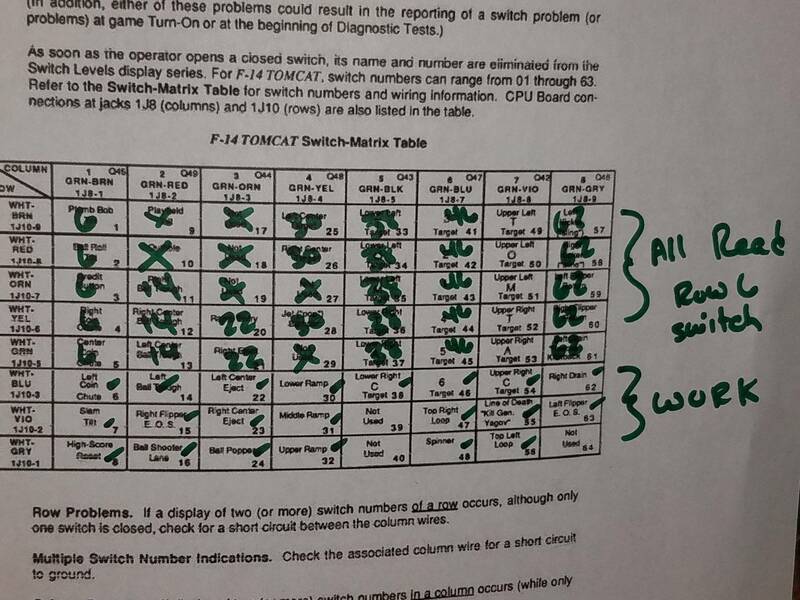 UPDATE: This morning after power up, the switch matrix is going crazy again. The balls in the trough are causing other switches to think they're closed. I did change all the diodes on the trough switches, no luck. I'm totally confused on this one. Game is good then goes to crap after it sits. Not sure if U30 and U39 got toasted again or not. I had the game playing 100% last night. On power up today, matrix is freaking out again. What the heck?? Those failing can cause havoc with the chips? The one does appear burnt. Without looking, they are most likely pull up resistors. Yes, they can play havoc with the signals if one or more resistor in the pack has failed. I ordered some to replace all the networks in that area. We'll see what that does. Did you ever test the chips? The burn marks on SR-11 and SR-10 shows that the EOS switches have been shorted or are still shorting to the lane change switches. If you are smoking the Nand chips then the resistor packs are not the cause but an effect. I changed out the resistor arrays at SR9, SR11, SR14 per the advice of wayout440. I put new chips into U30 and U39. Grumpy i am half tempted to follow your advice and check the last set of chips to see if they are indeed bad or if it was the resistor packs. So again, the game is playing 100%. But I've been here before. I'm not out of the woods yet. Thank you all for your advice, I may need more soon. i am half tempted to follow your advice and check the last set of chips to see if they are indeed bad or if it was the resistor packs. 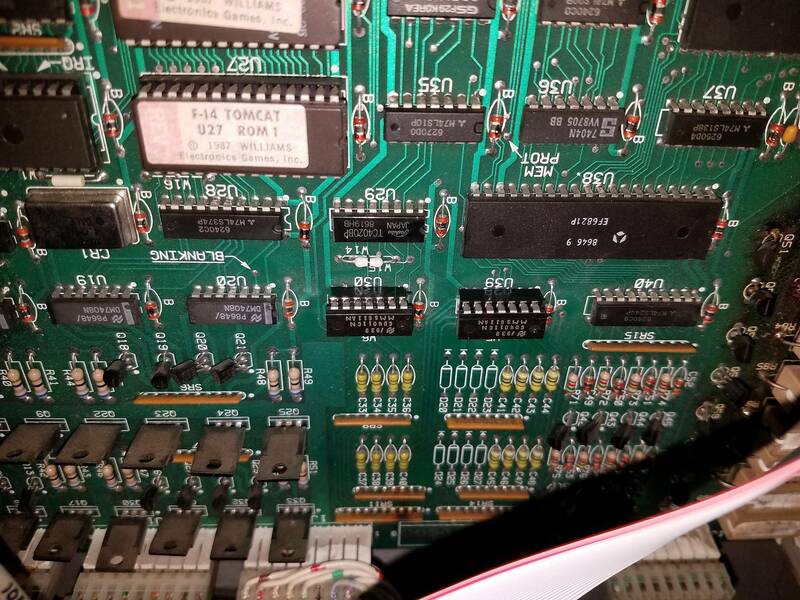 Even if the resistor packs were bad, there would not have been any damage to the chips. There only would have been crazy switch matrix issues. So far so good! Tomcat was left on this evening for several hours. I played a few games randomly throughout the night and it's still acting normally. I'm still not ready to call this resolved just yet.